JIIPE is the first integrated estate in Indonesia, with total area of 3,000 hectares, consisting of industrial estate, multipurpose port, logistic center, bonded zone, leisure area, commercial area, and residential township. Located in Gresik, JIIPE will be the most strategic industrial hub in Indonesia. With 1,761ha area for industrial estate, 400ha for multipurpose ports, and 800ha for residential township, JIIPE offers 3 modes of transport to reach domestic and global international market; from a deep sea port at your doorstep, 3.5 Km from Manyar Toll Gate, and the new Direct Toll Railway in 2020. Located strategically in the mouth of Madura Straits, our attached port will be the deepest port in East Java (-16 LWS). with 4 jetties and 6,200m total berth area, JIIPE could cater capsize vessels up to 100,000 DWT. The main purpose of JIIPE is to make a positive contribution towards efficiency of logistic cost. This estate combine complete infrastructure, which include deep sea port, dry port and direct toll access as ways of transport to domestic and international market. Public Private Partnership JIIPE is a PPP project between PT. AKR Corporindo Tbk and Pelindo III, through their subsidiaries, to maximize the synergy and sustainability of the project. JIIPE industrial estate is an eco-friendly environment of 1761-hectare area, offering complete utilities and amenities. This integrated flood-free complex with lush and green residential estate and deep-sea port is located strategically to be trading hub and manufacturing center for Indonesia and Asia Pacific. 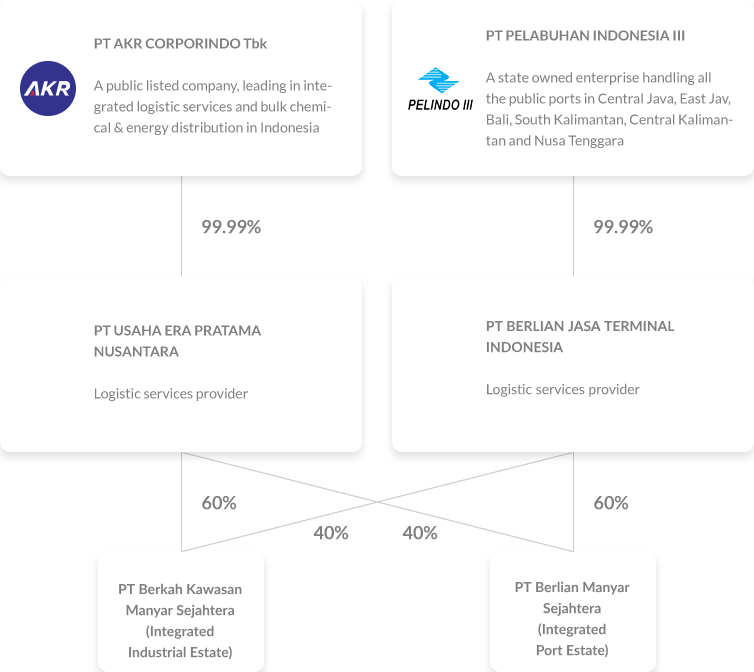 Industrial lots for heavy, medium and light industries, Bonded Logistic Center, Bonded Warehouse, Single window processing system and Immediate Single window processing system and Direct Construction License (KLIK), full services utilities (Electricity, Gas, Water Supply, Solid Waste Management, and Waste Water Treatment Plant). •	Direct double track railway access, connected to access points in Java Island. •	3 Hour Investment Licensing Service. 400ha integrated deep seaport estate strategically located in Madura Strait, with 6200m total berth length, sea water depth of jetty at -7.00 LWS, -11.00 LWS, -14.00 LWS, and -16.00 LWS, this port could cater capsize vessel until 100,000 DWT and a part of greater Surabaya port district. •	Services: conveyor system, piping system, water supply system. For further details about JIIPE, please visit www.jiipe.com, or download our catalog below.